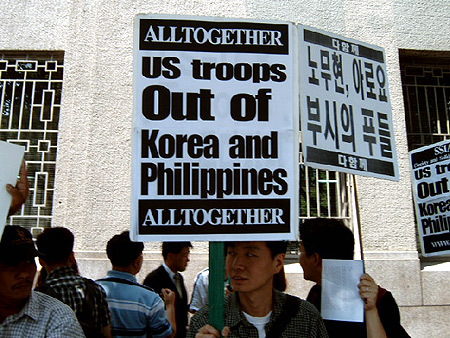 Some Filipino groups in South Korea said today on the conferment of the title of 諭�on-NATO ally?to the Philippines by US president Bush, so the representative of KASAMMAKO. 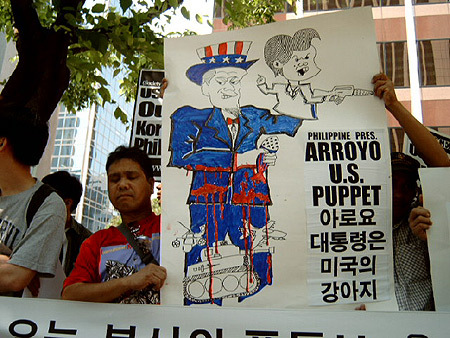 Filipino president Arroyo, one of the main supporters of the US imperialists, is visiting South Korea. 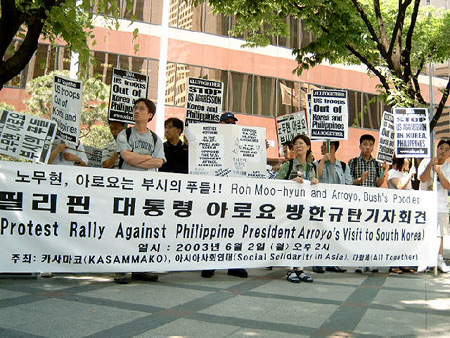 For this reason KASAMMAKO Filipino migrant worker organization Da-hamkke (All Together) and Minju nodong-dang (Democratic Labor Party) organized a protest rally downtown Seoul. Opposite Lotte Hotel the residence of Arroyo the Korean demonstrators pointed out that like Arroyo also South Korean president Roh is a willing helper for the US administration's militarist policy of aggression. The representative of KASAMMAKO pointed out: "Arroyo has joined the world's butcher club. It's not something to be proud of." 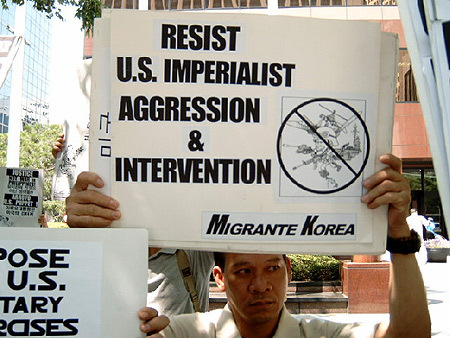 Some Filipino groups in South Korea said today on the conferment of the title of "non-NATO ally" to the Philippines by US president Bush, so the representative of KASAMMAKO. He said that the title is "a source of shame for Filipinos". "It's not pride that we feel but tremendous shame. NATO is not such a reputable group to belong to for it's only purpose of existence is to protect the economic interests of superpowers like US through coercion and sheer brutality," he declared. 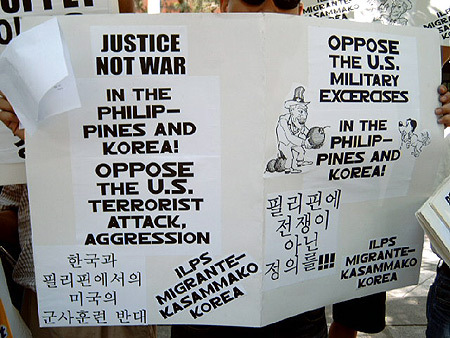 Korean and Filipino protesters demanded the end of military partnership between the Philippines and South Korea with the US. They - very sharply and noisy - demanded the withdrawal of the US troops out off their countries.